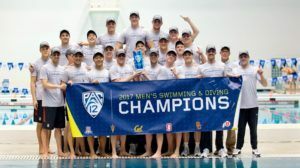 Stanford won its 33rd Pac-12 title, but the Cal Bears showed that they’re ready to go toe-to-toe with Texas in a few weeks. 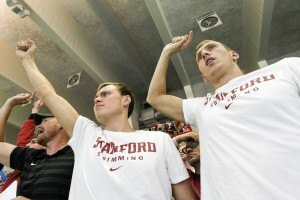 The Stanford men won their 33rd Pac-12 title on Saturday. Cal backstroke star Ryan Murphy put up the 9th fastest performance of all time to break his own Championship Record with a 1:38.04 on night 4 of the 2017 Men’s Pac-12 Championships. 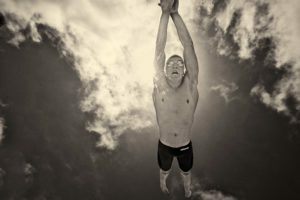 Stanford freshman True Sweetser broke a Pac-12 Meet Record that had stood for over a decade on Saturday night at the 2017 Men’s Pac-12 Championships in Federal Way, Washington. The Stanford men, led in part by freshman Grant Shoults (pictured), took the Pac-12 team title tonight. The 2017 Men’s Pac-12 Championships in Federal Way, Washington continue tonight with finals of the 500 free, 200 IM, 50 free, and 200 free relay. Stanford will look to extend their lead in the team battle, but the Cal Bears will be fighting to move up in the ranks and close the gap. This morning, we saw all 3 individual events topped by a freshman. Stanford’s Grant Shoults took the top seed in the 500 free this morning, and will vie for the title alongside fellow Cardinal freshman True Sweetser in the final. 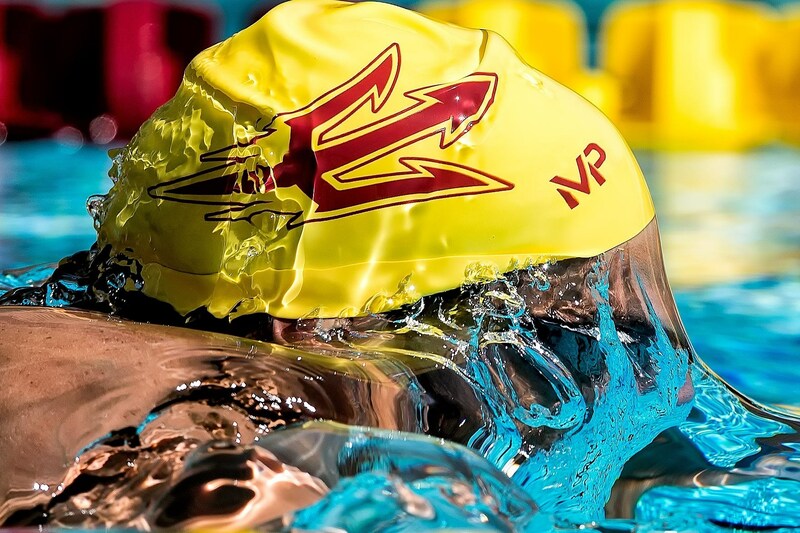 In the 200 IM, Arizona State’s Cameron Craig made a big statement to take the top seed, but he’ll be challenged by Cal’s Ryan Murphy and Andrew Seliskar tonight. 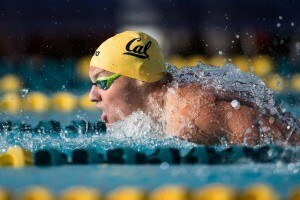 Finally, Cal’s Pawel Sendyk will take on a stacked 50 free field that includes defending champ Sam Perry (Stanford), Dylan Carter (USC), Santo Condorelli (USC), Justin Lynch (Cal), and fellow Cal freshman Michael Jensen. Stanford freshman Grant Shoults busted out a new Pac-12 Meet Record in the 500 free, dropping a second and a half from his best time to win in 4:10.67. Shoults credited his time spent working on his walls as part of the reason for his success. He also had great closing speed, splitting a 24.32 on the last 50. True Sweetser secured a 1-2 finish for the Stanford freshman, while defending champ Reed Malone picked up bronze for USC, stopping the Cardinal from sweeping the podium by out-touching Liam Egan (4:14.71). Cal’s Andrew Seliskar used his breaststroke speed to break ahead of teammate Ryan Murphy and continued to extend his lead through the freestyle leg, winnign the race by over a second. Stanford’s Abrahm DeVine chased Murphy into the finish, coming up just short as Murphy took the silver and DeVine the bronze. Arizona State’s Cameron Craig hammered home in a 23.71, but finished just off the podium with another lifetime best 1:42.75. Behind him, Stanford’s Tom Kremer (1:43.21) out-touched Cal’s Michael Thomas (1:43.31) for 5th place. Cal got 3 men onto the podium, as Pawel Sendyk reached into the wall first and Michael Jensen tied with Justin Lynch for the bronze behind Stanford’s Sam Perry. Just missing the podium by a hundredth was USC’s Santo Condorelli (19.37), followed by teammate Dylan Carter (19.40). Cal’s Pawel Sendyk got the Bears the early lead with his 19.29 leadoff, with fellow freshman Michael Jensen taking on the 2nd leg in 18.99. Justin Lynch (19.11) and Ryan Murphy (19.07) closed for the Bears as they won it in 1:16.46. Stanford picked up the silver, highlighted by Andrew Liang‘s 19.07 on the 3rd leg, while Arizona State’s Richard Bohus popped an 18.86 on that leg to help the Sun Devils earn bronze. Has anyone figured out if there is a stream we can watch? There’s none that I know of…? I want to know as well, if there is one!